Second Annual One Day Conference for Betrayed Spouses. You are not alone. We remember the sleepless nights, the agony, and loneliness. We understand that life after betrayal is a jumble of emotions - anger, dejection, fear, and a tremendous sense of loss, to name a few. Fortunately, we know how to navigate the swirling chaos that surrounds a betrayed spouse because we've walked through it ourselves, and we've walked alongside thousands of others. Regardless of whether the unfaithful spouse is supportive, unsupportive, or gone, we want you to feel hope again. Whole again. Receive encouragement from survivors who are thriving. At the Hope Rising conference, we want to restore those in crisis to extraordinary lives of meaning and purpose. You may not be able to see it at this very moment, but through the despair and pain, hope can rise. All ticket sales will be donated to the Affair Recovery Scholarship Program! Take a brave step out of the turmoil and do something just for you. Join us for the one-day Hope Rising conference in Austin, TX. We've planned an event only for betrayed spouses filled with hope, practical strategies and resources. We have a seat saved for you. Watch the Live Stream online! Cindy is a mentor and speaker with a tender heart for betrayed spouses that was cultivated through her own season of despair. Cindy is the author of Healing Your Marriage When Trust Is Broken and Rebuilding a Marriage Better Than New. She serves alongside her husband, Chris, at Life.Church in Oklahoma City, one of the nation's largest churches. 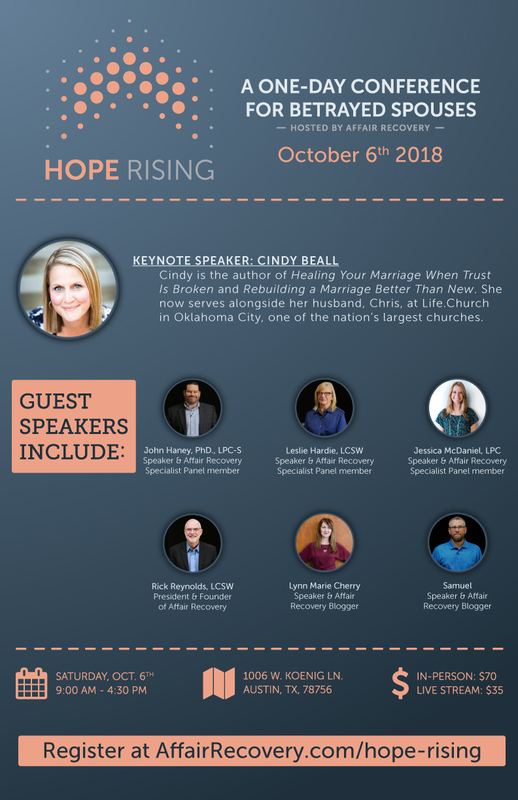 In addition to Cindy, you'll hear from members of the Affair Recovery team of experts – Rick Reynolds, LCSW, Leslie Hardie, LCSW and John Mark Haney, PhD, LPC-S, as well as other betrayed spouses who will inspire you with their stories. The schedule also includes a break out session for men led by Dr. Haney and for women led by Jessica McDaniel, LPC. Food is not included but you'll have 1.5 hours to get lunch wherever you'd like! Hope Rising event tickets are non-refundable upon purchase, but fully transferrable to a substitute registrant up to, and including, the day(s) of the event.